Half a day Padi introduction course to Scuba Diving.The Discover Scuba Diving comes with theory taught through the PADI booklet which comes with the program, followed by your first breath in shallow water and practice of diving skills to end with a dive in clear and calm water. Perfect for those who want a taster of Scuba Diving. This dive can be credited towards Scuba diver or open water diver course in Sardinia. A great way to start your scuba diving holidays in Sardinia. This is a perfect Padi Diving Courses to take in Sardinia for those who have a short amount of time but want to learn diving. A two and half day diving course certifies you as Scuba Diver and lets you go diving with a diving professional at a maximum depth of 12 metres. This course is the first two days of the Open Water course. The most famous entry level diving course. With easy theory sessions combined with videos, confined water session in a calm clear bay, and four great open water dives in safe and beautiful spots. This will make you a certified Open Water diver for the maximum depth of 18 metres. The Open Water course is recognized all over the world. Avoid spending your time on holidays in the classroom, arrive in Sardinia to get straight into the beautiful underwater world, choose to complete all the theory, exams, videos online with the eLearning PADI method, please click on the logo below to get started ! A great way to start your scuba diving holidays in Sardinia. For these two diving courses the minimum age is 10 years old and the maximum depth is 12 metres. 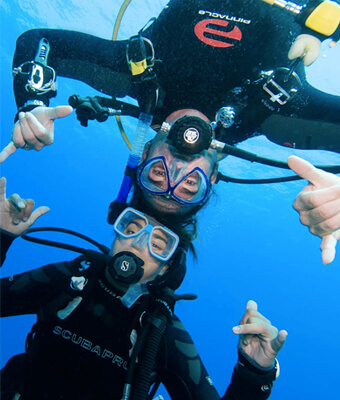 In that respect the whole family can enjoy these Diving courses together. Junior Advanced Course and different Junior Speciality courses Those courses are also available for children with a minimum age. Please contact us for more details on these courses prerequisites. The BUBBLEMAKER is the perfect choice for the young ones, minimum age 8 years old to blow bubbles with the dive instructor at a max depth of 2 meters.